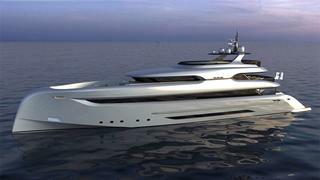 Turkish yard Bilgin have two new projects on the go - a new 147 and a new 164. The Bilgin 147 is a 45 metre yacht which shares many of its design features with their recently-launched superyacht M. Fitted with twin 1915hp Caterpillar C32 engines, the 147 will have a top speed of 22 knots and will cruise at 17 knots. The yacht will have accommodation for up to 12 guests, in a master stateroom, a VIP cabin, and four double guest cabins. Bilgin has also signed a contract for a Bilgin 164, Alfulk. At 49.90 metres LOA, this yacht will feature a traditional bow compared to M and the 147, and will be powered by twin 1650 hp Caterpillar 3512C engines, giving her a top speed of 16 knots and a cruising speed of 13 knots. There will be accommodation for up to 12 guests, in a master stateroom, a VIP cabin, and four double cabins.